If you ever wondered what the S.T.A.R.S. Academy might mean to the players and families who participate, then please read the message below. We received it earlier this year from a parent in the program. Truly Heart Warming. Please share the S.T.A.R.S. Academy information so more kids can participate and more people can volunteer. 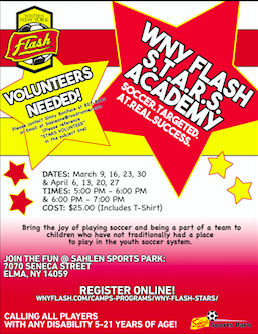 We'd love to see the support staff include lots of WNY Flash Academy Players again! I wanted to take a minute to thank you - and all involved in the S.T.A.R.S. Program that Flash puts on. My son (11 yrs), has been a participating athlete and really looks forward to every week. I am not sure if you, or any of your fantastic volunteers, know what a wonderful thing you are doing. I'm sure it feels like the right thing to do, and is fun to see these kids smiling and running around. But what you don't see is the overall impact it can have on the athlete and the family. Some of these athletes don't get to experience being part of a team, something most of us take for granted. My son gets excited the day of practice, loves to wear his jersey and tell people he's on the team. He loves getting his water bottle ready - something I think most typical kids would never think of as "exciting;" but he knows his brothers do it - and on STARS day, he gets to prepare his water bottle. He loves seeing his fellow athletes, and the volunteers who are so genuinely kind to him, whether he is having a good day or not as good day. He can't always say their names, but he knows them the second he sees them. As the parent who watches, it is great to see him interacting with new, exciting people. It is priceless to see him so happy and running around with a smile and kick the soccer ball like his brothers do. Every parent wants their child to succeed, and when we get to see these kids so happy, we know what success really means. Thank you again for all you and your program does for these kids. I'm sure you will never understand how much you are really doing for these kids and their parents. I hope you are having a wonderful Christmas and holiday season with your family!